In the past two days alone, the biography of Jeff Bezos, the world's richest man has taken more plot twists than a M. Night Shyamalan flick and includes a superstar cast complete with President Donald Trump and a cameo by political sensation Alexandria Ocasio-Cortez. If Amazon.com Inc. boss Jeff Bezos really wants his company's movie production division to create a blockbuster hit, he might want to let them focus on his own life. In the past two days alone, the biography of the world's richest man has taken more plot twists than a M. Night Shyamalan flick and includes a superstar cast complete with President Donald Trump and a cameo by political sensation Alexandria Ocasio-Cortez. The saga began last month when the e-commerce pioneer used Twitter to announce he and Mackenzie, his wife of 25 years, planned to divorce. Within hours, the National Enquirer exposed Bezos's relationship with former TV anchor Lauren Sanchez. That sounds pretty pedestrian now. The story took on hard-to-believe Hollywood proportions on Thursday. In a lengthy blog post, Bezos accused the National Enquirer and its publisher, Trump-ally David Pecker, of blackmail and extortion, publishing email exchanges to back it up. 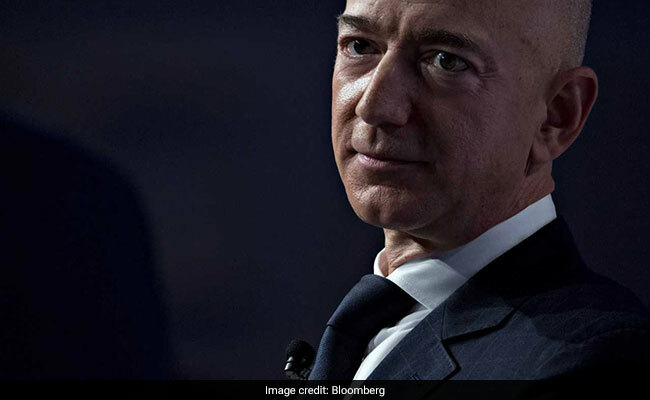 The Enquirer threatened to publish graphic selfies of a scantily clad and sometimes exposed Bezos, saying the images are newsworthy because they reveal poor judgment by the leader of the world's biggest online retailer. Bezos representatives argued publication of his private images would violate copyright laws. The Enquirer said it would not publish the photos if Bezos agreed to issue a statement saying the magazine's reporting isn't politically motivated. The tabloid also wants to stop Bezos investigating how the photos leaked. The billionaire has hired Gavin de Becker, a private investigator to the stars, to find out what happened. The blog laid bare the tactics of a tabloid that years ago ended John Edwards's presidential run by exposing an extramarital affair, and more recently protected then-candidate Trump by buying the stories of women who allegedly were sexually involved with him and then never publishing a word. The post also highlighted the shrewd public-relations tactics of a billionaire who refuses to be cornered. Forget the portrait painted by the Enquirer of a moneyed philanderer in a mid-life crisis. Bezos cast himself as a hero, protecting the First Amendment at his own risk. His ownership of The Washington Post, which has published stories critical of Trump as well as investigations into the killing of Saudi journalist Jamal Khashoggi, is a "complexifier" in his situation, he said. Bezos decided to expose the correspondence with the Enquirer, and risk photos of himself being shared with the world, to stand up against blackmail and extortion and ensure the integrity of the Washington Post, he said. "It's unavoidable that certain powerful people who experience Washington Post news coverage will wrongly conclude I am their enemy," Bezos wrote. "President Trump is one of those people, obvious by his many tweets. Also, The Post's essential and unrelenting coverage of the murder of its columnist Jamal Khashoggi is undoubtedly unpopular in certain circles." The feud between Trump and Bezos is well known, but the suggestion of a potential connection between the Enquirer's expose and the assassination of Khashoggi was a bizarre twist. Khashoggi was a leading critic of Saudi Arabia's de facto ruler, Crown Prince Mohammed bin Salman, whom Trump regards as an important ally. A Saudi Arabian envoy said the kingdom wasn't involved in the fight between Bezos and the National Enquirer, calling it a "soap opera." Bezos's accusations quickly took on far-reaching ramifications. Federal prosecutors are reportedly reviewing the National Enquirer's dealings with Bezos given the company's earlier cooperation deal with prosecutors. American Media Inc., owner of the National Enquirer, agreed not to commit crimes to avoid prosecution over hush-money payments to women who claimed relationships with Trump. AMI said it acted lawfully in reporting Bezos's affair, but will investigate claims by the CEO that it was politically motivated. Bezos's bombshell allegations were followed Friday by a new revelation. The Washington Post said Amazon was considering withdrawing plans to expand in the Long Island City neighborhood of New York City due to an unrelenting political backlash. New York Gov. Andrew Cuomo and city mayor Bill de Blasio both celebrated Amazon's decision to invest $2.5 billion in the city and hire 25,000 people over the next two decades. But several local politicians who were shut out of the negotiations have criticized tax breaks offered to Amazon, questioning the company's anti-union stance and worrying about low- and middle-income residents getting squeezed out by rent hikes as highly paid tech workers move in. The news, later confirmed by Bloomberg, shows how Bezos has become a prime target of populist politicians highlighting growing wealth disparity. The idea of tax breaks benefiting the world's wealthiest man have taken on a life of their own. And the suggestion that Amazon's response to public scrutiny is to threaten to move its project elsewhere isn't sitting well. U.S. Representative Alexandria Ocasio-Cortez, an outspoken critic of the deal, took to Twitter to celebrate the possibility that Amazon would pack it in, saying it proved people could "come together and effectively organize against creeping overreach of one of the world's biggest corporations."